One of the great things about owning a wine shop is that we have to try a lot of different wines. (I must say here that the greatest thing about owning a shop, hands down, remains our terrific, interesting and loyal customers. I am sorry if it sounds like pandering, but it is nonetheless true). We first became enamored with Austrian wines in 2006, just after we opened Windham Wines. Until then, we drank wines made mostly from a handful of grapes with which we were familiar and within that small world, we also narrowed further to mostly red wines. We had a lot of catching up to do to stock a wine shop! The path to that reputation for quality was rocky. After WW II, the Austrian wine market was focused on bulk production of Gruner and Riesling, both for its home market and for its principal export market, Germany. Then in 1985, a group of Austrian farmers, pharmacists and wine brokers was caught adding diethylene glycol, an ingredient found in antifreeze, to its bulk wines to enhance its perceived sweetness. The market for Austrian wine collapsed. Millions of bottles were destroyed, dumped into the ovens of cement plants so that their contents did not contaminate sewers. West Germany banned imports of Austrian wine. The wine scandal of 1985 produced at least two consequential changes for Austrian wine. Since it was sweetness level that led wine brokers to search for substitutes to ripeness and natural sugars in the berries, Austrian wine producers shifted to drier wines that could be made even in cooler years when natural sugars were lower. Secondly, Austrians passed strict regulations meant to ensure wine purity. that transformed Austrian wine production to a focus on quality instead of quantity.Austria now makes “some of the raciest, most exciting wines in Europe. To taste them is to be convinced” (MacNeil, The Wine Bible, 591). We are convinced, and so are many of our customers. 65% of Austrian wine is white, and the lion’s share of that is made from the grape Gruner Veltliner, a grape that can run the gamut from light, lean, green apple and lime flavors to lush, tropical fruit, flowers and something refreshingly green like fresh peas, parsley, occasionally cilantro or tarragon. Our favorites tend to finish with a nervy jolt of acidity and spice. After our first trip to Austria for wine purposes in 2008, we began to look forward to the arrival of the new vintage Austrian wines each year. In recent years, we’ve assembled our good friends who are also Austrian wine devotees, and enjoyed evenings together tasting the new vintages. In mid-summer, we collected again at Weingut (not really) Ramsburg-Larkin and sampled the newly arrived 2016 entry-level Gruners and eagerly-anticipated single-vineyard Gruners from the historic 2015 vintage, 13 wines, including 2 sparkling Gruners, all from the Lower Austrian subregions of Kamptal, Wagram, and the Wachau. While there are too many wines for me to review here, let’s just say that it was a delicious evening with the entry-level 2016s exceeding expectations and a single-vineyard (Lamm, the lower area of the Heiligenstein butte) wine from Weingut Steininger in the Kamptal leaving us all wishing we had a magnum. What a beauty! 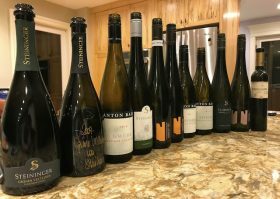 We had to agree with Robinson and MacNeil,– Austrian wines, particularly their whites and, for our tasting, the Gruners, provided an impressive tasting experience with consistently high quality. Windham Wines has one of the largest and strongest collections of Austrian wines in Vermont. Currently among the 25-30 Austrian wines in stock, we have 12 different Gruner Veltliners (11 still, one sparkling). We invite you to come in and select a few, collect a group of friends, and taste them together to see for yourselves what makes Austrian Gruner Veltliner so compelling.